You might be looking to try out designing, maybe as an entrepreneurial venture, as part of a learning experience or simply for fun. The best Silhouette Cameo bundle still remains to be a great asset to you. If you are looking for a tool that will make neat designs and that works efficiently, then this is an option worth considering. In addition, you can create your project layout on your laptop and actualize your designs on a variety of materials. You’ll end up gaining more for less through the bundles as you get a variety of tools that work well together. This tool works just like a printer machine. It simply connects to your device (computer, laptop or tablet) through a USB cable or by portable wireless Bluetooth technology. Silhouette Studio has an interface that is simple to interact and work with. Nonetheless, you can choose to learn from more experienced users through tutorials. You simply have to download and install it and you’ll be good to go. It is after you are done with designing that you can have the cutting machine actualizing your project. The Silhouette CAMEO 3 wireless cutting machine has a blade that cuts through a wide variety of materials which includes; Fabric, Vinyl, and Paper. Another great thing is that it offers dual-carriage. As a result, it can hold two tools and simultaneously perform two designing functions all in one job. This ensures efficiency, makes designing a lot easier and saves up time especially when working on multiple projects. In addition, the Silhouette CAMEO 3 wireless cutting machine has matless cutting capabilities. This allows it to cut through some materials without the need of a mat. This is really helpful as you’ll cut the extra costs intended format replacement. Finally, it has a large storage space. This is mainly to offer enough space to store all your Silhouette tools and additional blades. As a result, all your tools are stored together at a central point as opposed to storing all of your tools separately. The Cameo only actualizes designs made from the Silhouette Design Studio. It is through this powerful software that you can create designs or rather buy them from the Silhouette store. The software is versatile and therefore allows efficient designing. Furthermore, Cameo is operated through its own LCD Touch Screen. This provides a more clear visual display and user interaction making it easy to operate. In addition, this bundle comes with the SiserEasyweed Heat Transfer vinyl which is Vinyl that applies when even when exposed to low levels of heat. Its advantage is that it functions well with lower pressure settings and works well on a variety of materials. Plus, it is durable and therefore does not easily wash off. Additionally, it is not easily lifted after weeding and comes in a variety of colours making it a great DIY design tool. Also, as its name suggest, it is easy to weed and so easy to work on. The Oracal Vinyl is a lot like the Easyweed Vinyl but it will probably require a lot more heat for it to apply. It is however made to be a lot more resistant to cracking and peeling and has great dimensional stability. The Cameo automatically adjusts its blade so as to much the requirements of the material being cut through. This blade can cut through a variety of materials including cardstock, vinyl, paper and fabric. In addition, the Silhouette studio doesn’t require an internet connection to work. This, therefore, allows you to work even when there is poor or no internet connection available. This simply means that Cameo is able to register and cut printed or even hand-drawn materials. Therefore, you can start working on your projects with the absence of Silhouette Studio Design. It also provides an option for those who are not comfortable working with the Software. Working on DIYs is a lot easier and efficient when you have a number of tools to help you the problems you encounter. With this bundle come a cutting mat, auto blade, scrapper, hook tool, vinyl trimmer, and scraper tool. Using these tools will probably be hard for you during your first days. That is why the bundle comes with a vinyl guide and a heat transfer guide to help you through your first rookie days. You are still very likely to work through a project despite being inexperienced with or without the guide. This is mostly because Cameo’s interface is easy to interact with and it basically leads you on. The LCD touch screen allows for easy control of your tools during crafting. I’m sure you’ll soon be designing like a pro. The wireless connections make this a great option as opposed to other corded brands. This is only because you can move around with your device without expecting the connection disruptions. Buying this package ends up saving more than buying the individual items separately. Plus, it will end up saving on your internet bill as it works without any internet connection. It comes with its own designs and fonts and it also allows you to make your own unique designs at no additional cost. It also comes with the Silhouette Cameo 3 which has a touchscreen and uses Bluetooth technology. It comes with an auto blade (automatically adjustable blade), cutting mat and Silhouette toolkit consisting of; hook tool, scraper tool, ratchet adjustment tool, vinyl trimmer, USB cord and a power cord. This package also comes with a user instructional guide to quicken the time to master the craft. Learning is also aided by online Cameo 3 instruction class and silhouette Studio V3. It comes with membership to Silhouette University and a subscription to Silhouette Club. This aids your learning process and eases the process needed for the replacement of accessories. The package comes is relatively small in size and is generally light in weight. Some of the benefits of this Cameo are that it comes a number of digital downloads found in the Silhouette’s Design Store, has premium transfer tape, permanent Oracal 651 vinyl, and unique Silhouette Designs. The Cameo not only allows you to create your own designs, it also lets you pick from a list of exclusive designs. Cameo experts are provided to each new customer. These experts are well experienced in designing using Silhouette products and are therefore more than capable when it comes to answering any questions. One can contact them easily using the exclusive options given such as email, phone, text messages or even video chat. For this Cameo, although internet connection is not required for day to day functionality, internet connection may be required in downloading and updating software hence arrangements may be made every once a while in case where internet is not available or speeds are slow. Includes Silhouette Cameo V3 Machine, more than 100 designs from Silhouette, Cross Cutter Tool, blade adjustment tool, cutting mat, Silhouette Tool Kit (Quick Pick Up tool, hook, scraper, spatula hook, shammy, and ruler), auto adjusting blade, inbuilt Bluetooth, USB cable and standard power cord. The package is inclusive of Oracal 651 vinyl, transfer papers, Craft-e-Corner vinyl and Silhouette Sketch Pens. Some of its advantages are access to Silhouette online store, a digital book, a vinyl clinic assisting in solving vinyl related problems and preventing their recurrence. Its main disadvantage is one may need internet connection from time to time. For this product, the user can begin to create projects from day one due to its Do It Yourself characteristics. It can also be connected by either Bluetooth or USB cable. It has a blade that cuts a wide range of materials. This Cameo can register printed materials and proceed even to cut them into desired shapes and sizes. It is also PixScan compatible. (PixScan is ideal for converting a sketch that was hand drawn into a cut job). Has premium vinyl with a variety of colors, transfer paper, Silhouette scraper, Silhouette hook and a download card for vinyl designs. This allows to you to make a lot more complex designs easily. The package is also inclusive of an instruction guide, online beginner class, vinyl guide by Silhouette Guru Melissa Viscount and Silhouette Studio V3. The accessories included in this bundle are; auto Adjust Cutting Blades, Scrapper tool, hook tool, ratchet adjustment tool and metallic pen sets which come with different color options. The bundle includes membership to Silhouette University, Club Silhouette, template downloads in Silhouette design stores and Studio software. Its benefits include access to online Cameo Instructional Class, projects are saved offline meaning internet connection is not mandatory, Silhouette Software has real editing features which allow path editing, molding and vectoring, are able to cut out long strips of vinyl by a method of a direct feed. Its main disadvantage is its bulky nature hence making it a bother to transport. 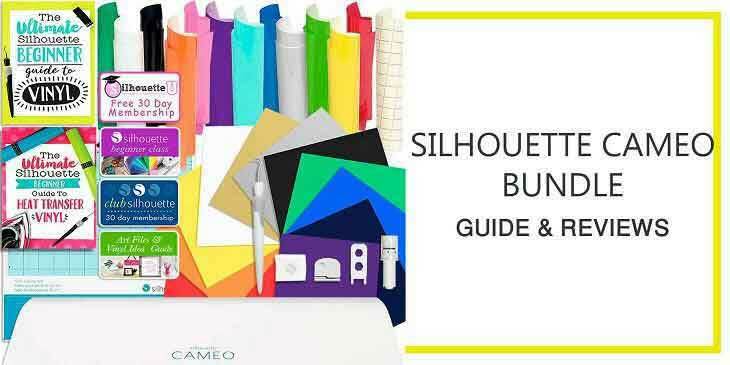 To use Silhouette Cameo, you need to have a shop for other equipment that is as important as the Cameo itself. Cutting mats are necessary when working with vinyl and paper. It is common for one to buy new mats after a couple of months due to the demands of these Cameos. Cutting blades also need to be replaced often because they become rather blunt after use especially when cutting through tough material. They are similarly usually replaced every few months. You also require a weeding tool which is simply used to remove the undesired vinyl hence leaving the design only. The Silhouette Weeding hook is efficient and can be held for long periods especially because they are comfortable. They are also able to focus on minor details one may want to cut out. Scrapper tools are normally curved and tapered giving you a sharp edge hence can be used to remove unwanted items that tend to stick on the cutting mat or to rub small pieces of vinyl onto other surfaces. It is fairly simple to use even for a beginner. A dust cover is also essential to keep your design looking new and tidy even long after working them and also keeps your tools in good condition. Transfer paper is mainly used for vinyl that is not HTV (Heat Transfer Vinyl) to move the design to your project in the simplest way. Items that are not the best for your Silhouette Cameo experience are; the Silhouette Spatula due to its being difficult to use, Silhouette Weeding Tool Kit as it has certain items that one might never use hence is not a good value for your money item and finally is the Sketch pens which should only hand-drawn for artist who are planning to do a lot of drawing. If you are the creative type and you just love coming up with new designs and learning how to construct new things, then shopping for Best Silhouette Cameo Bundles is the right thing to do. By purchasing a bundle you get to own a particular combination of handy tools. DIYs are especially very easy to craft if you know how to properly use these tools. Mastery comes with practice of course but finding a guide or simply watching tutorials will go a long way into actualizing your creative thoughts. There are several bundles to choose from and selecting just one could get really confusing especially for beginners. You can now make comparisons on each of the bundle’s prices to their functionality. Either way, each of the bundles will serve you with a lot of benefits and who knows? It could even be the kick-start your art career has been hoping for.